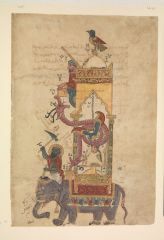 This folio comes from a treatise on fantastic devices invented by the author Isma‘il al-Jazari. 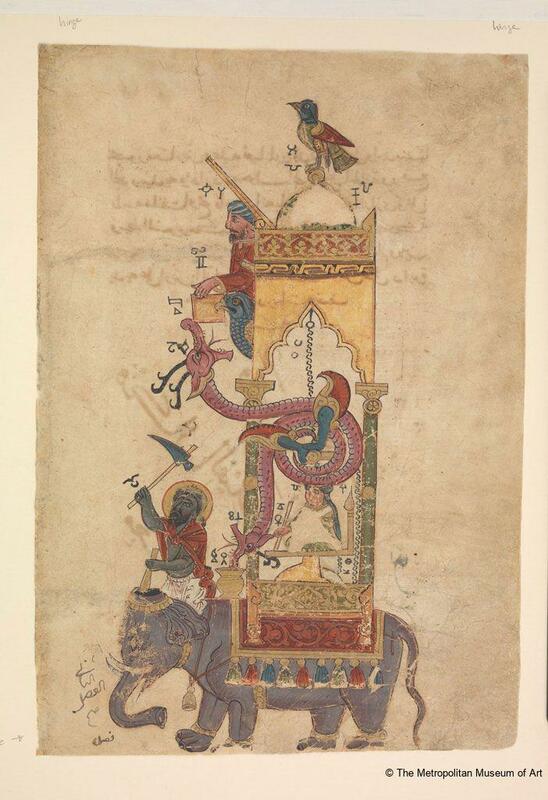 His elephant clock was especially intricate: every half hour, the bird on the dome whistled, the man below dropped a ball into the dragon’s mouth, and the driver hit the elephant with his goad. This automaton is reminiscent of the elaborate clocks found on medieval town halls in Europe, which made the passage of time more entertaining through the performance of the moving figures. The folio is a rare survival from Syria, where few such manuscripts from this date are known. Ackerman, Phyllis, Guide to the Exhibition of Persian Art, New York. The Iranian Institute, New York: The Iranian Institute, 1940: no. Gallery VII; case 72G, 190. Atil, Esin, Art of the Arab World, Washington, D.C.: Smithsonian Institution, 1975. Atil, Esin, Renaissance of Islam: Art of the Mamluks, Washington, D.C.: Smithsonian Institution Press, 1981: 255–57. Bernus-Taylor, Marthe, L'Etrange et le Merveilleux en Terres d'Islam. Musée du Louvre 23 avril–23 juillet 2001, Paris: Musée du Louvre, 2001. Campbell, Thomas P. (ed), The Metropolitan Museum of Art Guide, New York: The Metropolitan Museum of Art, 2012: 133, ill. (colour). Dimand, Maurice S., "New Accessions of Islamic Art", Metropolitan Museum of Art Bulletin, 16 (April 1958): 227–335, ill. 229 (b/w). Ekhtiar, Maryam, Canby, Shelia R., Haidar, Navina and Soucek, Priscilla P. (eds), Masterpieces from the Department of Islamic Art in The Metropolitan Museum of Art, New York: The Metropolitan Museum of Art, 2011: 6, 143–45, no. 92, ill. 144 (colour). Roxburgh, David J. (ed), Turks. A Journey of a Thousand Years, 600–1600, London, New York: Royal Academy of Arts, 2005. Swietochowski, Marie and Ettinghausen, Richard, "Islamic Painting", Metropolitan Museum of Art Bulletin, New Series, 36/2 (Autumn 1978): 4–5, ill. 5 (b/w). Welch, Stuart Cary, The Islamic World. Vol. 11, New York: The Metropolitan Museum of Art, 1987: 50–51, ill. fig. 35 (colour).